I thought I would post a short summary of this summer’s solo trip, plus some pictures. For a change, I was not in the NWT. This year it was northern Saskatchewan. Logistics were straightforward. I drove to Points North Landing, about 470 km north of Laronge, and arranged charter flights with the Osprey Wings base there. I flew in to Bentley Lake, about 45 miles north. 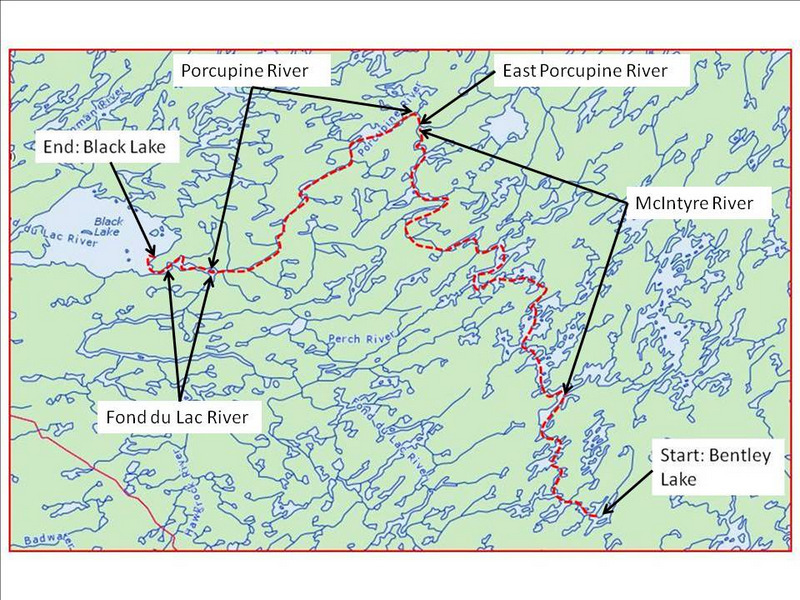 From there I paddled and portaged north and west through Merritt, Obst, and Babiche lakes to join the McIntyre River in Nordbye Lake. I followed the McIntyre north and west to its junction with the East Porcupine River, and just 3 km further on, the main Porcupine River. I followed the Porcupine southwest to the Fond du Lac River, then followed the Fond du Lac west to Black Lake, from where I flew back (about 75 miles) to Points North. Laurel Archer’s “Northern Saskatchewan Canoe Trips” offers good information on the Porcupine and Fond du Lac. Erik Munsterhjelm’s “The Wind and the Caribou” includes an account of ascending the Fond du Lac and Porcupine to his trapping grounds in the 1930’s. The McIntyre was then the “Grease Lip”, and the East Porcupine was known as the “Nest” river. The Porcupine was just the Porcupine. Getting upgraded is always a treat when flying. The Beaver was off somewhere when I arrived, so they flew me in with the turbine Otter, at the Beaver rate. Bentley Lake offered a nice beach for unloading, and a good first night’s campsite. Portaging north and west towards the McIntyre, formal trails were rare, but the forest was generally quite open. Still, I was glad to reach Nordbye, and find a small beach campsite there. across the land in a SSW – NNE direction, and bedrock exposure is uncommon. This makes for generally easy rapid running, as the river has carved clear channels through the glacial till. Flat outcrops, when encountered, make for great camping – in the burn at an old hunting site before Misekumaw Lake, and on an island in Fanson Lake. Frost Lake was strewn with water lilies. At its outlet, the shield emerges from below the glacial debris, and the character of the river and the country change abruptly. Not far before the sprawling Pinkham Lake, the McIntyre spills over a beautiful falls. The ridges of shield rock that define the country grow steadily higher as you continue west towards the Porcupine. With the volumes of the East Porcupine and McIntyre added to it, the Porcupine carries a considerable volume of water: this is the first rapid below the junction. How long did this route take you? I would love to talk to you for more details if at all possible? That route took 17 days, and was only about 250 km. I scheduled a slower pace because I wasn't familiar with that area, and didn't want to have to rush down the Porcupine's rapids. As it turned out, the schedule was quite relaxed, a good thing as I had some very hot weather early in the trip and then some rain and wind later on. attaching my trip notes from the route. With them, and some online maps, the route should be pretty clear. Archer's book will be a big help with the Porcupine. If the email doesn't come through, or you have further questions, send me a PM and I'll get back to you. Many thanks for posting. I always enjoy your selection of pictures and the story that goes with them. Thanks for posting your report, jmc. Beautiful photos. That part of Canada holds special memories for me. I was a fishing guide in the mid-seventies at Jackson's Lodge on Waterbury Lake. During my time there mining companies were doing reconnaissance trips down the Hell's River into Waterbury Lake. Unfortunately, they found what they were looking for. Since then: Points North, the road, the mines, and other developments. As guides we used to run 16-foot motorboats with 20-horse motors with half a dozen backup shear-pins up and down the Hell's River (flowing in at the South) and the Unknown River (flowing out at the north). The grayling and the pike fishing were excellent in the rivers. We used to run several sets of rapids down to and back from Unknown Lake where there was a very quiet, usually deserted, outpost cabin owned by an outfitter named "Bill," if I remember correctly. In my googling of Waterbury Lake I come up with next to nothing. I believe the fishing lodge was bought up by the mining company at some point. Do you know if there's much activity on the lake? A return to the region by canoe is on my bucket list. Especially the route down the Unknown River (AKA the Waterfound) to the Fond du Lac and beyond to Black Lake. Some of my fellow guides were from Black Lake, as well as Lac Brochet and Brochet. Those were very special times.